A Book About Living as the Source of WHO You Are. Seeds for the Soul is a fascinating collection of thoughts, ideas and speculations recorded in my private journals over the past 25 years. The book weaves philosophy, psychology and non-dualism together into a world view that is both comprehensive and practical while being one that points directly to the Source of who we really are. “Seeds for the Soul is a powerful expression of spiritual truth. These pages are like lotus flowers that open, revealing deeper and deeper insights and wisdom. Another remarkable work from Chuck Hillig." "I love this book. I've found myself dipping into it again and again, and every dip is liberating. As always, Chuck manages to express profound truth with utmost simplicity. His delightful lightness and sense of humor are infinitely valuable to anyone with a tendency to take life too seriously. His writing always transmits the sense that everything is perfect just as it is. As always, he shows the reader that there is nothing to seek and nowhere to go. At the same time, he offers some excellent pointers on living wisely and fully, and some clear insight into what therapy from a non-dual perspective might be about. That ability of his to dance on both the relative and absolute levels at once, and always from the absolute understanding, provides a truly useful, unique, and rich perspective. I highly recommend this and all of Chuck's wonderfully enlightening books." "This book is a real classic. Your words brought me back to that precious stillness which is me. Thank you. I had no idea how truly resonant your words are with that which I know." "Chuck speaks to the intellect in a paradoxical manner so that it may ultimately understand its limitations in understanding the Soul and can finally give birth to a new way of seeing beyond the veil of conceptualization. This is Chuck's gift to you; a method of knocking down your intellect into Awakening by the use of non-dichtohomic language." "The book is a remarkable work which gets better every time you give yourself a chance to dip into it. Its simplicity adds to the profundity of its message. I thoroughly recommend "Seeds for the Soul." "This is a book I will gladly recommend. I really like your straightforward, humorous writing style. Most of all I like the way you stress the importance of living life fully; experiencing fully - a message that can't be stressed enough, in a time when advaitic idealism often tends to exacerbate the whole problem of superficial living. You have such a nice easy going way of expressing yourself. What I really appreciate is how you put the spiritual life into perspective by dealing with the human life practically and that makes for a good thought-provoking book that I think a lot of people can benefit from." "Starting with my first sampling of this book, I was immediately impressed and delighted. Throughout, Hillig offers hundreds of small gems of wisdom that shine brightly. The themes of Nonduality are expressed with his usual ingenuity and clarity, and so are the interwoven sub-themes of psychological and therapeutic advice for living as the Source of who you are. "Seeds" is, in other words, an aid not only to awakening to one's own absolute nature, but also to living constantly in that awakened condition. In my opinion, although there are many excellent writers and teachers of Nonduality, no one surpasses Hillig in being as well rounded and as playfully entertaining on the subject. "Seeds for the Soul" is a worthy complement to his other popular books and deserves to be just as successful." "You've got a great book! The Seeds that you've spread around the garden yields a bountiful harvest...page after page. It's a feast of practical insight and wisdom spiced with humor to be enjoyed and digested slowly." “Don't be deceived! Chuck Hillig's books look friendly and harmless, but they are swords…and they are deceptively sharp! He writes serious books and they belong in the arsenal of every serious seeker." “The words of Chuck Hillig are like a stainless steel fist in a velvet glove. Out of the thousands of books available in the modern spiritual marketplace, very few books state their message very simply. Even fewer are truly profound. And a very, very tiny fraction of these are both simple and profound. Seeds for the Soul is one of those. 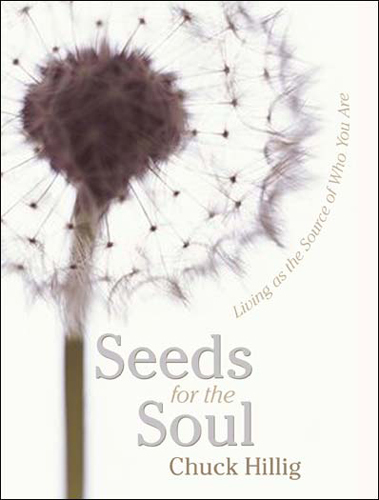 After reading Seeds for the Soul, it becomes very apparent how perfect the title is. Reading a phrase or page from the book is easy enough – its clarity is deceptively immediate and refreshing, and it “goes down” very easily. But then . . . the “seed” is “planted.” If just a moment or two is taken to really consider and uncover the meaning and implications of these seemingly simple phrases . . . if the words are nourished with just a few drops of real attention and consideration . . . then they soon sprout and blossom with a shining clarity into insights with a truly profound brilliance. Of course, the hard-earned nuggets of wisdom that Chuck is offering aren’t for everybody. He takes on the Big Questions, and his answers aren’t for the timid or faint-of-heart. Some of his statements – about everything from destiny and free choice to God and the purpose and the universe to core delusions at the root of human nature that are the ultimate cause of suffering – aren’t necessarily what everyone is talking about at the water cooler nowadays. And the simplicity – one of the best features – can at the same time be potentially hazardous, as any statements and insights all-too-easily can turn into slogans and “easy answers” (“It’s all an illusion!” “Just get rid of your ego!” “Be here now!”) which substitute for real understanding. "Seeds For the Soul" is a shining example of the gentle path to awakening. Chuck Hillig's latest book is a warm-hearted presentation of how life can be when we are honest and loving with ourselves. I recommend this book to anyone who is looking for depth in their spiritual quest. Do yourself a favor and keep a copy next to your pillow, your meditation mat, your elbow...and enjoy." 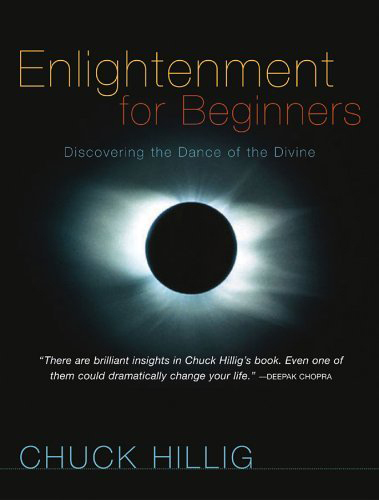 "Chuck Hillig, author of the classic "Enlightenment for Beginners," has created another elegant and enjoyable tome, destined for the spiritual bestseller list. The book contains observations and speculations that will quietly reverberate in the very depths of your consciousness. Whether they act as gentle reminders or loud alarm clocks, the musings contained on each page will lovingly direct you to the only person who holds your truth: YOU. I can’t think of a better book to pack for a long, lazy day at the beach or an afternoon at the park. Read a few pages, then lie back and soak up the sun and let the seeds grow." "Seeds for the Soul is a carry-everywhere book mixing eastern philosophy with western psychology. Each page is a matrix unto itself for conception on different levels of awareness. This is an exceptional work to help anyone live in harmony with the source of their real being." "Seeds for the Soul is a delightful book, full of simple truths that pierce through the veils of illusion. A good book for those who are ready to transcend the thinking mind and enter the truth of life lived now." “My bookshelf is small. It currently houses about 30 books. It seems like once a year, at best, a book will come into my possession that speaks to me strongly enough to make room in my permanent collection. "Seeds for the Soul" by Chuck Hillig, is one of these books. "Seeds" is filled with short, insightful passages that remind us who and what we truly are. Chuck Hillig did not assemble a 'feel good' spiritual pick-me-up of a book with "Seeds". Instead, he takes you by the hand, and leads you to a place where you can look reality square in the face. It's not a story you read; it's more like a good friend cutting through the confusion to simply share Truth. It's like the Bhagavad Gita on ritalin. “I would have to call this book a daily inspirational Bible. It is not written as a philosophy lecture that gives the reader the answers to life's greatest questions, but simply as small doses of spiritual insights that must be read and then absorbed. Not a book for a quick read but for a lifetime. The title is most appropriate- "Seeds for the Soul" is exactly what this book contains. Tiny seeds that once planted in the reader's mind will grow and expand, enabling the reader to find their own Truth. Read a thought-provoking page or an inspirational chapter and you will come away with what you need to make your life path clear. An excellent blend of Eastern philosophies, Western spirituality and down home-religion , this book speaks to everyone. The writing style is simple and concise with just a hint of mysticism. This book is not about someone else's idea of enlightenment or Truth. It is simply about YOU. This book joins author Hillig's other spiritual books as a must for the libraries of the spiritually curious. Buy this book and you will have an inspiration for every day and for every situation. It will make you think, and it will lead you...to YOU."